Inspire your students with a school ski trip to Chamrousse! 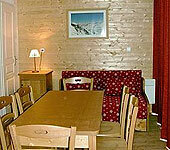 The ski resort is divided into three great bases: Recoin at 1650m, Chamrousse at 1700m and Roche Beranger at 1750m. There are spectacular views from the highest lift, which reaches 2550m, and a mixture of the high altitude and the snow cannons on the lower pistes ensure that the snow conditions are generally good throughout the season. There are plenty of après-ski activities to keep your students busy, such as ice-skating, a cinema and an indoor swimming pool, as well as the many restaurants, shops and cafes. All of this makes Chamrousse the perfect resort for your next school ski holiday to France. Any beginners in your group will spend their first few days on skis on the slopes around Roche Bernager, where there are a number of nursery slopes, and green and blue runs. 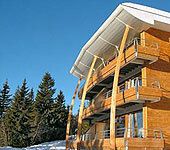 More advanced skiers will need to head for Le Recoin, where the terrain is much steeper. A lot of the runs are actually below the tree line, so if you love the magical atmosphere of zipping through the trees, you’ll love this resort. Chamrousse claims that a quarter of its visitors are snowboarders. And, with the fantastic terrain park and wide runs ideal for cruising and carving, any boarders in your party will find plenty to keep them entertained. Les Droseras is a collection of chalet style apartments situated in the village of La Domain De l’Arselle, 500m from the centre of Chamrousse. There are 59 modern apartments in total that are spread over three floors in five separate blocks. 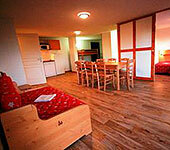 Each apartment is fully equipped with a private bathroom and kitchenette. Breakfast and evening meals are served in a restaurant next to the apartments as well as the option of a packed lunch on request. Groups also have the added bonus of using the outdoor heated swimming pool and spa and conference room that are attached to the restaurant.